The Triwizard Spirit Rally & Frog Choir are two unique shows that run throughout the day at the Wizarding World of Harry Potter. This is yet another show that brings the Harry Potter books and movies to life. 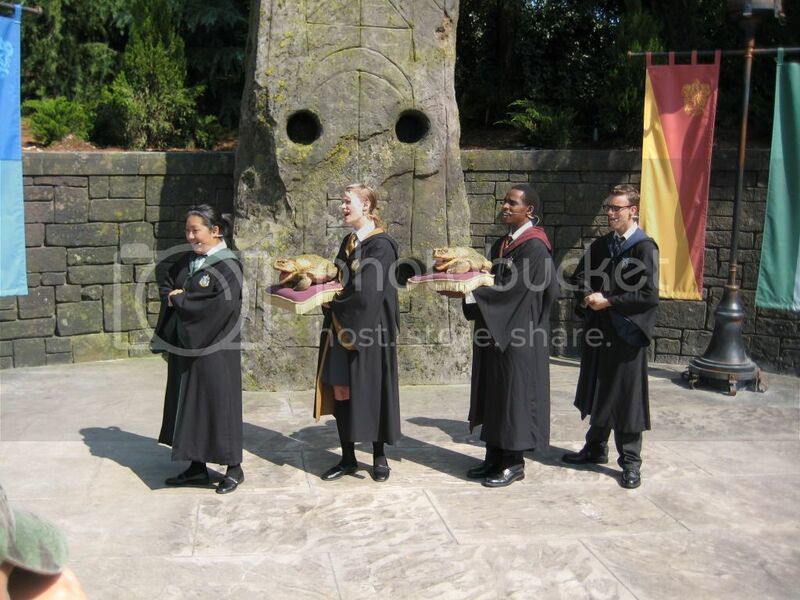 The 2 shows alternate on the brand new outdoor stage right near Hogwarts Castle and Flight of the Hippogriff. The Frog Choir is composed of a frog choir singing or croaking various songs from the Harry Potter movies. The Triwizard Spirit Rally features live perfomances by Beauxbatons and the Durmstrang students. The Triwizard Spirit Rally is hosted by a Hogwarts Prefect and is very similar to the performance from the movie, Harry Potter and the Goblet of Fire. Each show runs about 10 minutes in length and shows alternate throughout the day usually each half hour. The Triwizard Spirit Rally & Frog Choir are definitely not to be missed when visiting the Wizarding World of Harry Potter. For show times, ask a Universal Orlando team member at Guest Services or ask a team member within the Harry Potter park.